On a late September evening, we are treated to a wide cross-section of deep sky objects: star clusters, nebulae, and galaxies. Full Story. The end of September marks a transition in the night sky. With the bright stars of the Northern Hemisphere summer disappearing in the west, even brighter stars of winter ?will rise in the east in a changing tapestry of deep sky objects. The shift in Earth's seasons is a good time for skywatchers to prepare for the next round of stargazing. This sky map shows some attractive targets in the Northern Hemisphere as September passes to October. Looking beyond the big constellations of the Summer Triangle, we find the neat little constellation of Sagitta, the Arrow, which is surrounded by interesting objects. Just above the Arrow?s tail is Brocchi?s Cluster, popularly known by the more prosaic name of the ?Coat Hanger" because of its appearance: a straight line of stars topped by a very obvious hook. Above the point of the Arrow is the Dumbbell Nebula, one of the brightest and largest planetary nebulae in the sky. Moving away from the Milky Way, we spy two of the richest globular clusters in the sky, to which 18th century French astronomer Charles Messier gave the numbers 2 and 15 in his catalog. Look a bit farther south and you are in the watery constellation of Aquarius, where you can find two more planetary nebulae. The Saturn Nebula is very small and very bright, so it ?can be easily be mistaken for a star; it?s easy to see how Messier overlooked this object with his poor-quality telescopes. The Helix Nebula is the ?opposite of the Saturn Nebula: very large and very faint. It is probably the nearest planetary nebula to the sun, 700 light-years away, and is nearly half as big as the moon in apparent diameter. You ?will likely need a telescope equipped with a narrow band or OIII filter to spot it, unless you are blessed with really dark skies. When we get well beyond the plane of the Milky Way, we begin to see more distant galaxies. Two of the brightest galaxies in the sky are just above and below the two chains of stars that mark Andromeda. Above Andromeda is the large, bright Andromeda Galaxy, visible even in the centers of our cities. With a telescope you can easily see one of its satellite galaxies, Messier 32. Its other satellite, Messier 110, is much more difficult to spot ?in urban skies, and may require a trip to a dark sky site. Both satellites are farther away from the main galaxy than most people expect because photographs of the Andromeda galaxies are often overexposed, making the Andromeda Galaxy look much larger in pictures than it appears in our telescopes. Just below Andromeda is a much more challenging galaxy, the Pinwheel Galaxy, in the constellation Triangulum. Although almost as bright as Andromeda on paper, the Pinwheel Galaxy is much more difficult to spot in the sky because it lacks any central condensation and fades away to nothingness in all directions. It?s easy to sweep right past it in anything but the darkest country sky. Be sure not to overlook the interesting galaxy NGC 253 ? known as the Silver Dollar Galaxy ? in the little-known constellation of Sculptor. 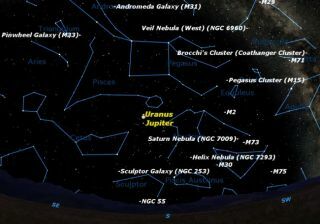 Tucked underneath the constellations Cetus and Aquarius, this constellation and its many galaxies are virtually unknown to observers in the Northern Hemisphere. Astronomers in the Southern Hemisphere know these sky targets well, especially the treasure that is NGC 253, one of the brightest edge-on galaxies in the sky. Although difficult because of its low altitude for northerners, the galaxy is still a fine object and worth searching for. Although 10 million light-years away, it is one of the brightest galaxies in the sky.